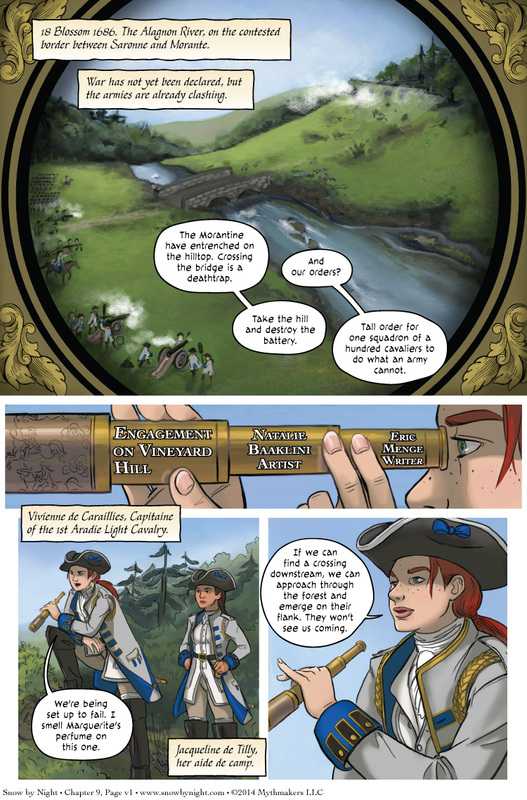 Tonight we are beginning the Chapter 9 vignette Engagement on Vineyard Hill, illustrated by Natalie Baaklini. Naty is the colorist for the main story of Snow by Night. She also draws fantastic horses. She’s even done this incredible drawing of Giavere. This vignette features Vivienne and Jacqueline as cavalry officers, making Naty the perfect artist for it. To see a glorious shot of Lieutenant Sylvine, commander of the second squadron of the 1st Aradie Light Cavalry, please vote for Snow by Night on Top Web Comics. This weekend is Nekocon! Diane and I will be there with books, prints, and buttons. Also, I’ll be sitting on some panels about comics and fantasy writing. Snappy uniforms! I like Viv better already.